The Code Profiling window displays function-level instrumentation counts, with timing, for each function entry and return during a sampled interval. There are two columns in the "Calls to Functions" data set (shown in pink in the Code Profiling window). The “Calls” column displays the number of times the function in the “Function” column was called during execution. The Percentage ” column shows the percentage of the total functions calls were made to the function named in the "Function" column. There are four columns in the "Excluded Times" data set (shown in green in the Code Profiling window). The “Excluded (mS)” is the time spent in the function listed in the “Function” column, excluding the time used by the functions called by the named function. 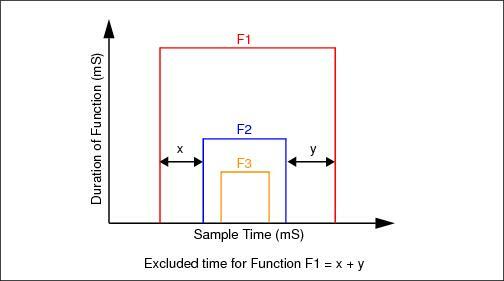 figure below shows the excluded time. The “Avg (mS)” column displays the average excluded time for each call to the function. 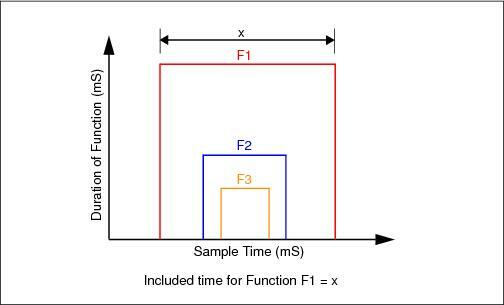 The “Min-Max (mS)” column shows the slowest and fastest excluded times for the function. The "Percentage” column shows the percent of the total excluded profile time used by each function time. There are four columns in "Included Times" data set (shown in blue in the Code Profiling window). The “Included (mS)” column is the time spent in the function listed in the “Function” column including the time spent by functions called. the figure below would represent the Included Time. The “Avg (mS)” column displays the average duration of the included function times. The “Min-Max (mS)” column shows the shortest and longest included amount of included time for each function. The “Percentage” column display the percent of the total included profile time represented by each function time.